Is there a better alternative to Eudora Internet Mail Server Light? Is Eudora Internet Mail Server Light really the best app in Servers category? Will Eudora Internet Mail Server Light work good on macOS 10.13.4? 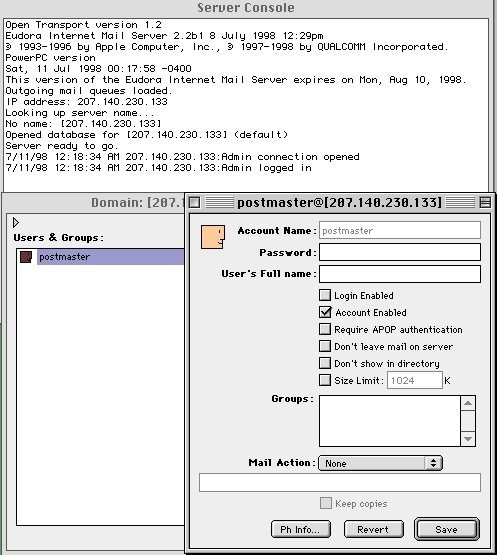 Eudora Internet Mail Server (EIMS) is a Mac email server, which is the ideal solution to providing a large network of of computers, or anyone on the Internet a place to collect and send email. It supports multiple domain name email addresses, as well as high-level features to expand your email services. Eudora Internet Mail Server Light needs a rating. Be the first to rate this app and get the discussion started!